Promoter Ed Francis' wrestling card at the Civic Auditorium in Honolulu held on October 16, 1971 featured four matches. In the opening match, Kongozan and Beauregarde wrestled to a draw. Jim Hady defeated Tosh Togo two out of three falls in the next match. Jim Hady waves to the fans. 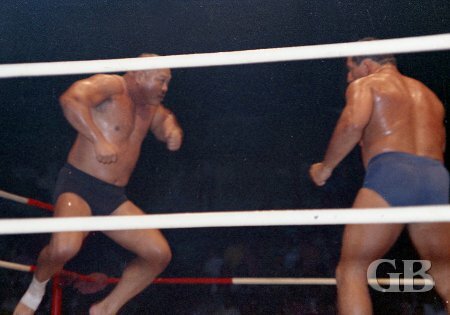 A bare footed Tosh Togo about to clash with Jim Hady. 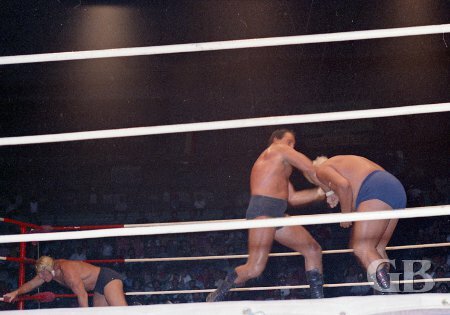 In a television curfew match, Paul Diamond and Karl Gotch wrestled to a draw. Karl Gotch flips Paul Diamond. Karl Gotch goes into a wrestler's bridge in an attempt to pin Paul Diamond. 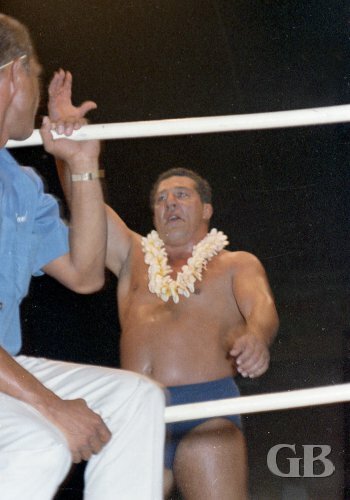 The main event match was for the Hawaiian Tag Team Championship between the defending champions Johnny Barend and Hans Mortier and the challengers Curtis Iaukea and Ripper Collins. Collins won the first fall with an Atomic Drop on Mortier. Barend evened the match with a knee drop on Collins to win the second fall. 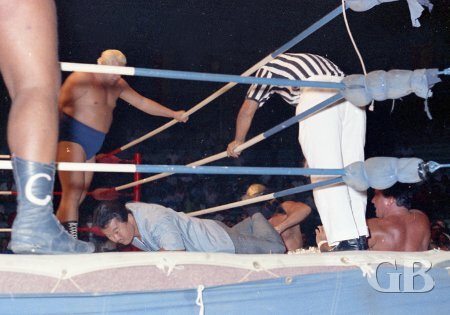 Harry Fujiwara, in street clothes, gets sucked into the opening of the match with Barend and Mortier outside the ring. A fresh Johnny Barend takes control of Ripper Collins as his partner Hans Mortier takes a breather. 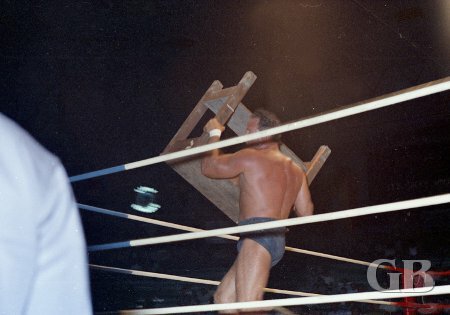 A frustrated Barend goes after Curtis Iaukea with a chair. Curtis Iaukea holds Johnny Barend down as Ripper Collins stomps away. Curtis Iaukea and Ripper Collins won the third and deciding fall to become the new Hawaiian Tag Team Champions. During the battle for the third fall, Johnny Barend got fired up when Mortier didn't want to tag. Barend tried about 3 times and the fourth time he hit Mortier in the face. Mortier went crashing down to the floor. Iaukea then came from behind, hit Barend, then applied an elbow smash to the throat for the winning fall. Iaukea then held down Barend while Collins and Mortier stomped on him. Shortly thereafter, Jim Hady came to Barend's rescue. Hans Mortier comes to the aid of his partner Barend. Collins and Iaukea gang up on Barend in the corner. 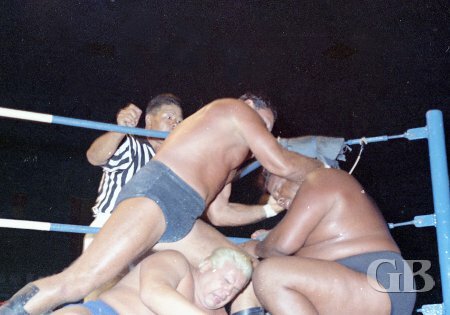 Johnny Barend unleashes on both Curtis Iaukea and Ripper Collins on the ring apron. Then he goes after them with the timekeeper's table.